Although originally relating to the countries of the New World who spoke Latin based languages, Latin America nowadays is used to describe the area from Mexico through to the southernmost point of the South American continent. The history of Latin America is as colourful as its wildlife and constantly being unearthed by researchers and archaeologists who use the works of art, sculpture, pottery and ancient architecture to learn more about the great empires who once lived there and left no written clue as to their lives. When visiting the area a Latin America travel guide is just the beginning for deciding where to visit as there is so much to explore, learn and experience. As archaeologists at ancient sites uncover new information about generations before us or the future is set to change along with a new Latin American government, the face of Latin America is always a changing one. 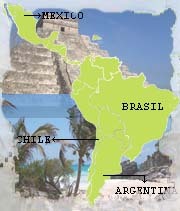 Learn here The history of Latin America from its discovery and conquering to the multinational reality of the present. 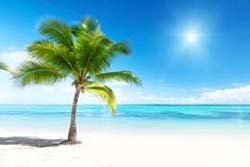 The Latin American weather is as diverse as the landscape - rainforests, golden beaches bathed in sunlight, wild tropical storms, snow capped mountains, arid deserts which see no rain and national parks with various ecosystems providing homes to the spectacular indigenous flora and fauna of the region. Visitors to modern day Latin America will feel like millionaires as the comparably weak Latin American economies allow our currencies to go so much further. Fresh local produce is always on the menu, with delicious latin food accompanied by smiling faces and the relaxed daytime lifestyle is contagious to even the most hardened workaholic who pays a visit. Latin nights are often as colourful as the days with the bright lights of the city complimenting the sensual latin music rhythms. Whether your preference is trekking the Amazon, cruising in the Caribbean, exploring the many world heritage sites or the adrenalin pumped parties and extreme water sports, Latin America is the place where dreams are a reality for the taking, living and loving and not just words on the page of your Latin America travel guide book. Our aim is to offer you a comprehensive guide so you can have all the information you need from organizing your visit to Latin America to other practical facts, like the means of transportation and the best places for sightseeing.